I think, like me, many people will have noticed an increase in the price of e-books in recent years. A subset of those people will be, like me, vaguely aware of an antitrust case around the selling of ebooks, involving Amazon selling below cost and Apple trying to disrupt the market. There was news last year that a court had declared that ebook purchasers were due a partial refund, and I felt some excitement at the prospect of a fat Amazon gift voucher (that hasn’t yet materialised). That was about my level of understanding before I downloaded The Battle of $9.99. It was a story that I felt I should know more about, and so I picked up the book to learn. In this short book, Albanese outlines the revelations from the antitrust court case against Apple. It’s a factual account that seemed fairly balanced in its assessment, and contained some genuinely surprising revelations along the way. For example, publishers whose books were previously sold below cost-price by Amazon now net a lower revenue per title despite increased consumer prices. Indeed, publishers were willing to accept that deal on the basis that the perceived value of books would not be eroded further, on the basis that it protects their profits in the long-term. It’s only a brief book, so this can only be a brief review, but it was nonetheless interesting. It was well-pitched, introducing economic and legal terms as necessary without either patronising or befuddling me as a reader with experience in neither. I would have liked a little more discussion about why this story had so little traction with the public at large, particularly compared to similar financial scandals in which consumers felt “ripped off”. I’d also be interested to read a similar account of iTunes disruption of the music market, but I guess without a antitrust suit, similar revelations are unlikely to meet public gaze. Back in the autumn, I reviewed Burning the Page by Jason Merkoski, which examined in much more detail the way in which technology has changed the reading experience. The Battle of $9.99 makes an interesting business-focussed supplement to that book. It’s well worth a read. 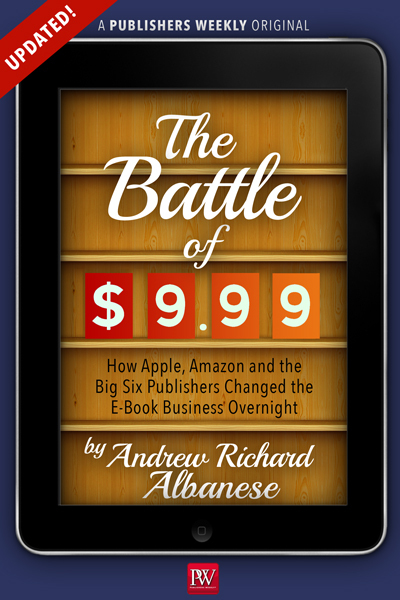 The Battle of $9.99 is available now from amazon.co.uk in Kindle format only. This 2,107th post was filed under: Book Reviews, Media, Andrew Richard Albanese.